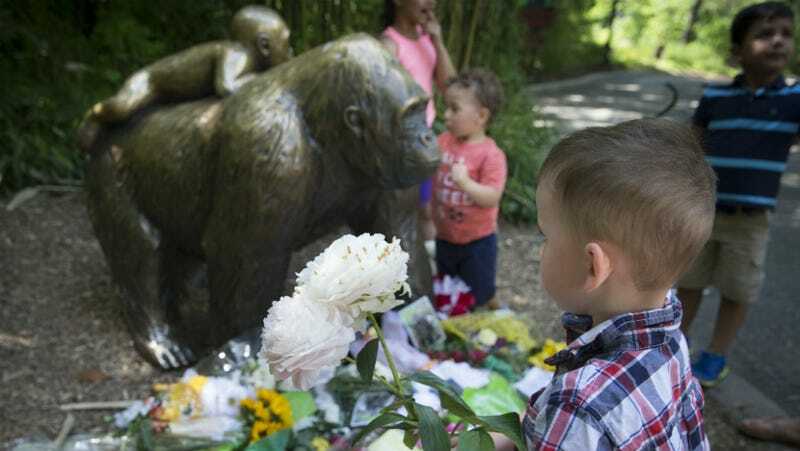 On Saturday, the Cincinnati Zoo shot and killed a 17-year-old gorilla named Harambe to protect a four-year-old boy who’d fallen into the animal’s enclosure. Now, people who evidently would have preferred to see a toddler die in Harambe’s place are angrily threatening the boy’s mother on Facebook. Except, displaying the typical savvy of the online vigilante, many of them are going after totally unrelated women with the same name. If you are a pragmatic and well-adjusted person, you probably see the incident at the Cincinnati Zoo as a tragedy, but understand that shooting Harambe was the call that people who know more about gorillas than we do made to save the life of a child. But otherwise, hell, go ahead and get on Facebook and search for “Michelle Gregg,” the name of the woman whose little boy scrambled away from her and fell into the enclosure. Then just yell at anybody who seems like roughly the right age and geographic location, because the internet was set up for the shoutiest impulses of people just like you! God protected my child until the authorities were able to get to him. My son is safe and was able to walk away with a concussion and a few scrapes... no broken bones or internal injuries. As a society we are quick to judge how a parent could take their eyes off of their child and if anyone knows me I keep a tight watch on my kids. Accidents happen but I am thankful that the right people were in the right place today.